So if you follow me on Instagram you know I have a slightly…okay, REALLY…unorthodox office. We have Nerf gun wars and beer tastings, on a regular basis. You should follow me if you don’t. I post all sorts of randomness that can make you smile like my mutts, DIY stuff and more! We work hard and play hard, and are all kinds of inappropriate in between. This post of inappropriate office gifts is not for the faint of heart, so if you are easily offended, look away now. I’m serious. I have a potty mouth and don’t want to offend anyone. Okay, you have been warned. I made mugs for three of my favorites at work. We have potty mouths, have been working crazy hours the past few months, and have to have some laughs in between. I will only post one photo of these to be safe. 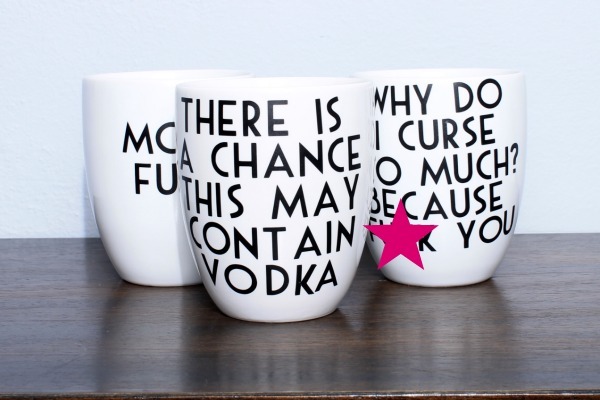 Yes, these are REALLY pretty inappropriate office gifts, but they were very loved. I know this doesn’t fly in most offices, but it works in mine. which is why I love it so. I wish I worked in your office! Too funny!